Three of the pubs I survey have raised their draft prices since I last checked. That's after one pub raised them last quarter. Beer on tap is going to cost you more going forward. I won't be surprised to see more price hikes at bars next time also. If you're very fastidious, you've noticed that the bomber prices quoted above don't add up with the difference to last quarter's price. It's because I made an adjustment, dropping Beer Valley's Leafer Madness from the index (at least for now). I had added it in a while back when it was difficult to find Pelican IPA around Portland, but this time -- for the first time ever -- every store I canvass had Pelican in stock. That by itself wouldn't lead me to kick Leafer out, but that beer was only on the shelf at one of the places I check. Ouch. That was supposed to be my high-end replacement for the fading Pelican, but the tables have dramatically turned. As always, fascinating stuff, Bill. The prices had been flat for a long time, so it's not surprising that they're ticking up. I also think I heard somewhere that distributors kicked up their prices. If that could be verified, it might explain a lot. 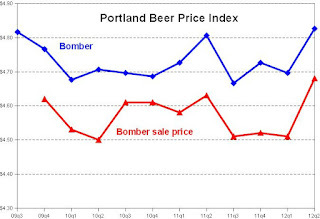 I always thought prices were high all around anyway, but I have noticed via my routine purchasing of beer, that even the most local bombers have hit astronomical highs in price. Even start-ups feel they can charge $12+ for a barrel aged bomber... and who are they to compete? I've found that lately I have avoided purchasing any beers to cellar. Why? Because the sticker is too high. To me it seems that it is almost a game. A game to see who will buy what for what price and profit. I'll stick with the brewers that don't play that game. Shame really. Competition is steep right now, and I still imagine numerous brewers dropping off in the next 4-6 years. Also distribution really needs to step up their game. These brewers rely on their distribution. All I see up here in Vancouver are old dated bottles that taste like dirt. I have found many around PDX the same. I won't always hold the retailer accountable, since distribution plays a huge role in market demand, and delivery. That's what they are paid for.. not just to deliver beer. Pelican switched distributors which lead to improved presence in the market. The number of bombers in the market is a bit (way) ahead of demand, particularly with higher priced bombers. This is contributing to some old beer accumulating out there. I think retailer pushback is going to start happening soon. @Jeff: Well, the six-pack shelf-tag price was unchanged. I don't know what's up with the distributors, but I'll ask around or maybe someone will comment here. 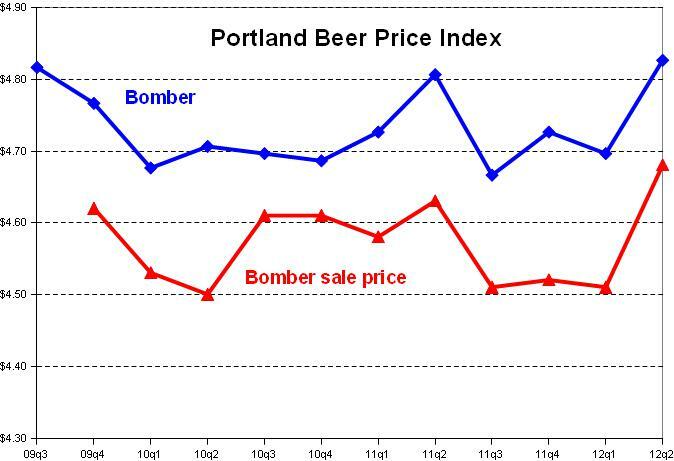 @Brewmance: I agree, the $12 Oregon bomber phenomenon mystifies me. Of course, so does the $4 bomber ($13.09 SPE). But if you can buy a big bottle of, say, Old Stock for $10 or $11, then it's a little puzzling to see $12-$15 price tags on new one-offs. They may be really awesome, and the brewery may be lavishing a lot of money on their production, but that's a hefty price. @priceit: As always, your comments are a valuable insight. When you say "retailer pushback", do you mean retailers will pressure the distributors to lower some prices? Or they will just stop stocking bottles they think are priced too high? I'm also intrigued by the thought of old beer accumulating on the shelf. That would be interesting to explore more fully -- we don't talk enough about how badly some good beer is treated. Retailers won't push back on specific retails because the brewers and distributors will defend them to the forever. I expect retailers will start telling distributors/brewers that based on the sales volumes in the luxury price segment that turns only support X number of brands being carried. X will be a lower number than the current levels being carried. At that point brewers and distributors will need to make the choice of letting brands go away at retail or reposition the price. Too many bombers and not enough luxury beer consumers. This has happened before, and it was not pretty.